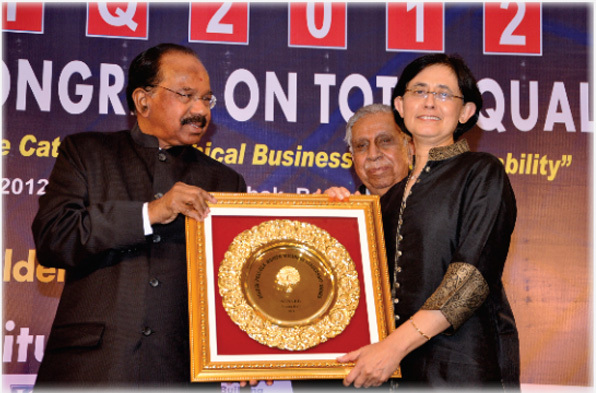 Ms. Vinita Bali has been the Managing Director and CEO of Britannia Industries Limited, Chairperson of Britannia Nutrition Foundation, Director of Piramal Glass Limited, Additional Director of the Bombay Dyeing and Manufacturing Company Limited, Additional Director of Bombay Burmah Trading Cop. Ltd., as well as Non Executive Director of Titan Industries Ltd..
Ms. Bali holds an B.A. degree in Economics from Delhi University, an MBA degree from Jamnalal Bajaj Institute of Management Studies of Bombay University. She also pursued postgraduate studies in Business and Economics at Michigan State University on a scholarship from Rotary International. Before she joined Britannia Industries Ltd., Ms. Vinita Bali has spent over 16 years overseas in a variety of marketing, sales and general management positions with eminent multinationals, companies like Voltas, Cadbury India, Coca-Cola and Zyman Group. The secret of Vinita Bali's success lies in a strong belief in creating sustainable models of corporate responsibility, as well as in trying and testing, without any fear to re-focus the energy of the company. Undoubtedly she is a person whose passion's are not limited to meeting deadlines or taking on boardroom battles. Ms. Bali is highly involved in works of Britannia Nutrition Foundation, whose approach is to not only prevent malnutrition in India, but also create a platform for all the disparate agencies that deal with nutrition to understand each other, and to dimensionalise the problem and, hopefully, lead to some concerted action. A transformational leader, Ms. Bali has won several awards and accolades for her business acumen and leadership. In 2009 she was named Business Woman of the Year by The Economic Times and ranked 18th among the world's top 50 business women by The Financial Times. She also featured among the 33 women who have done India proud.